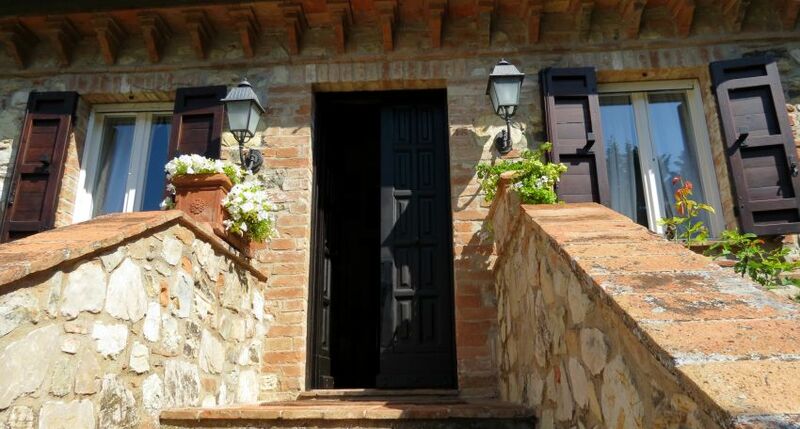 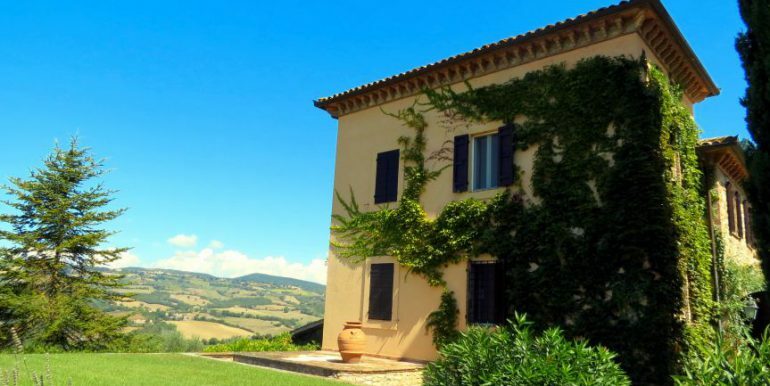 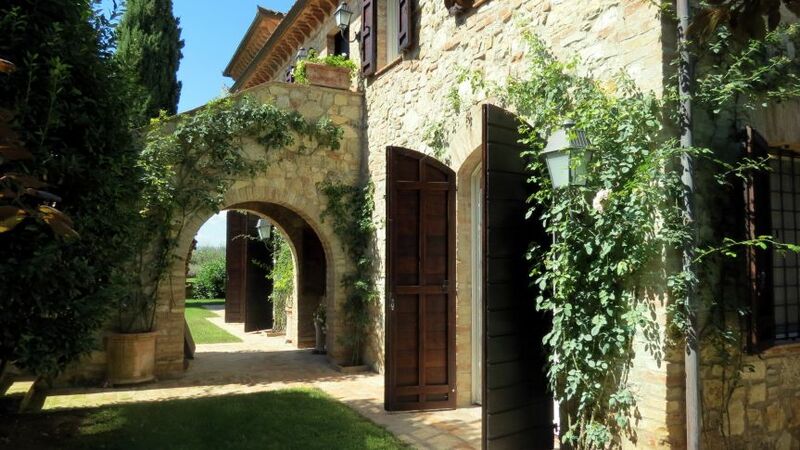 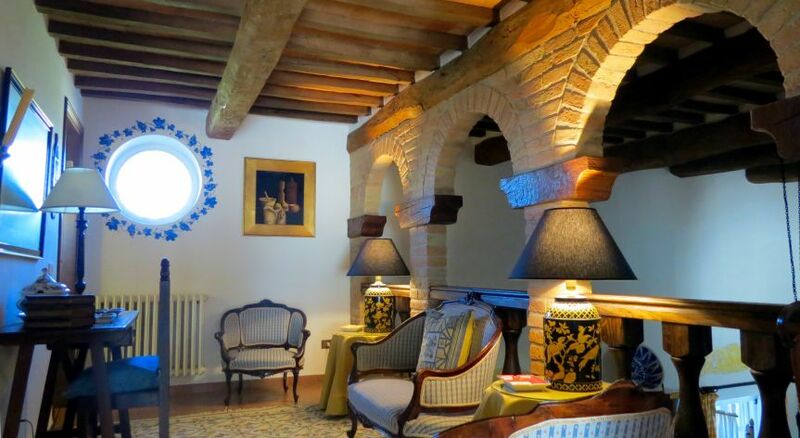 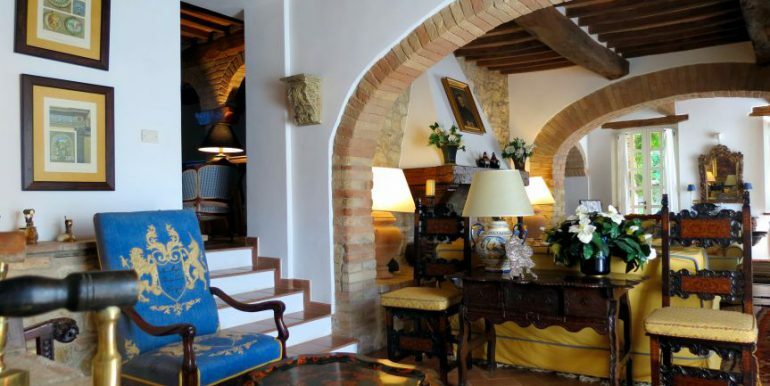 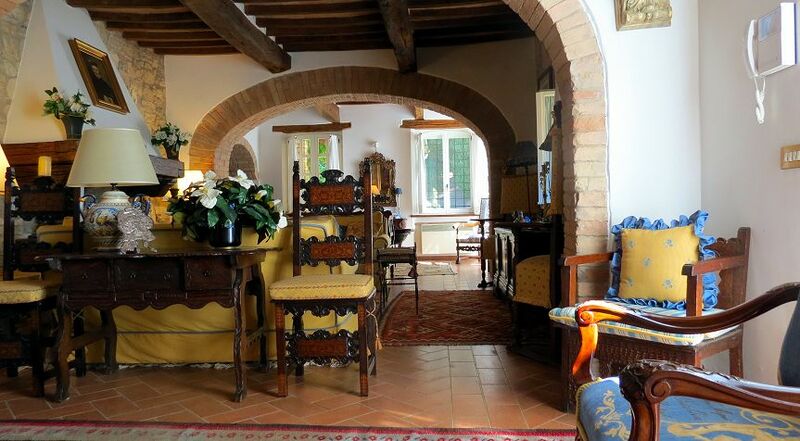 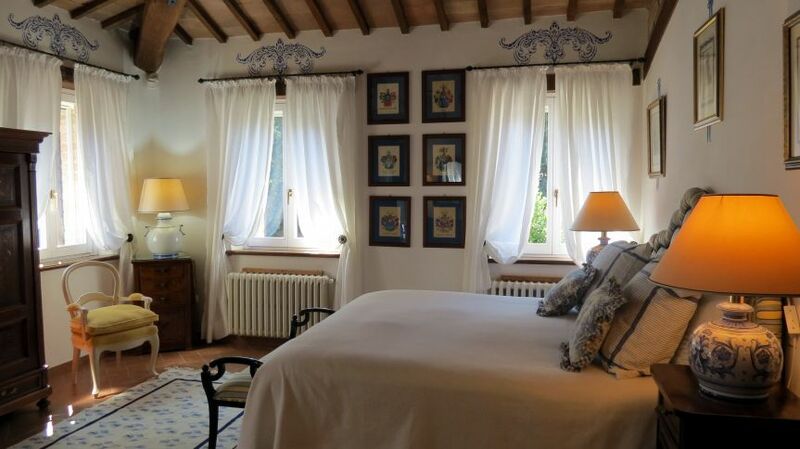 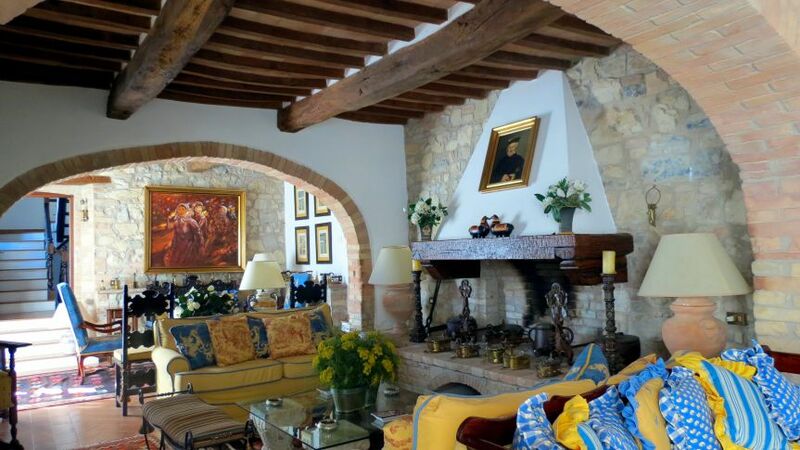 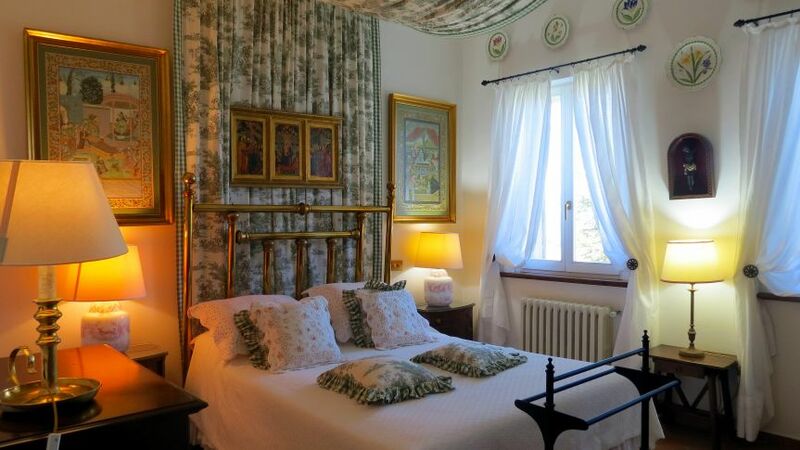 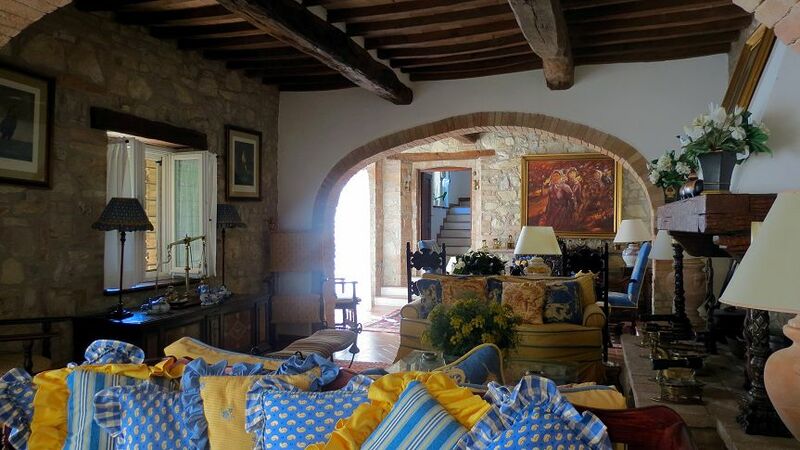 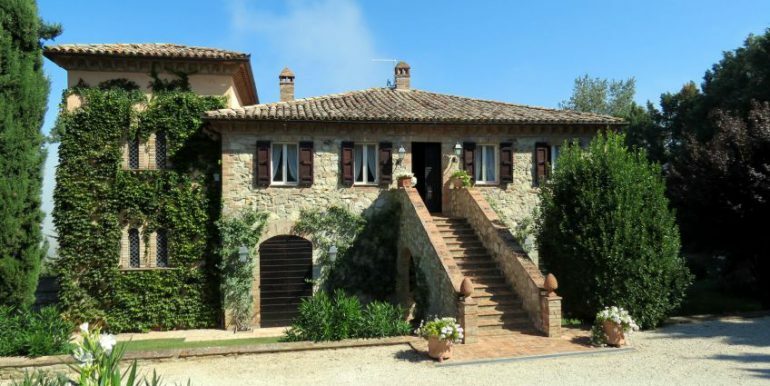 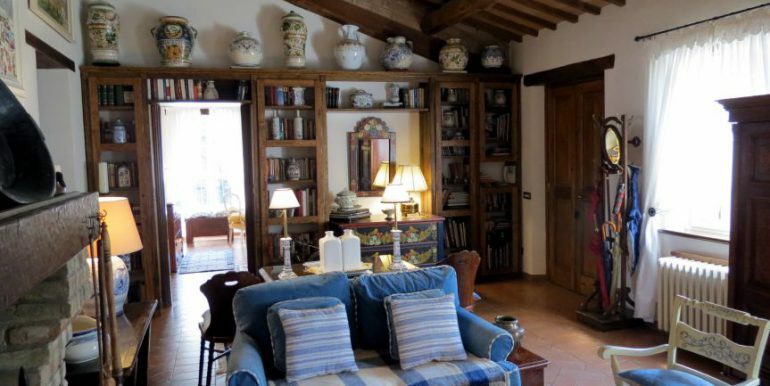 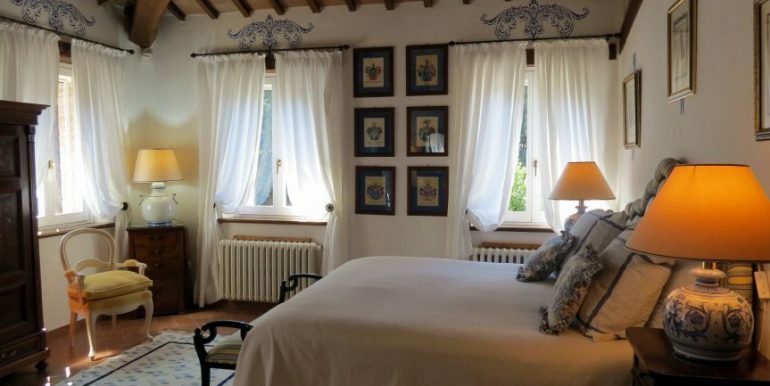 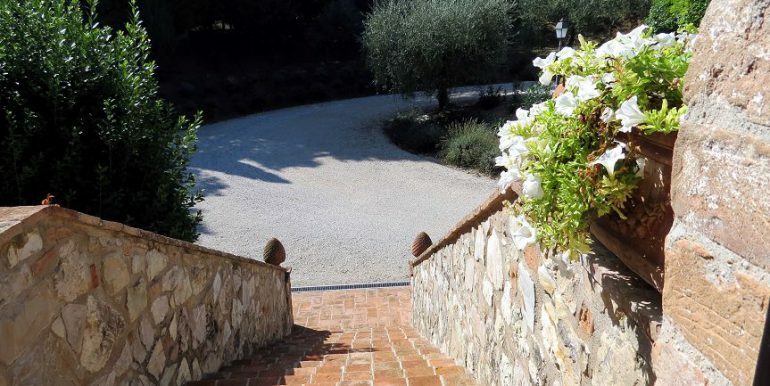 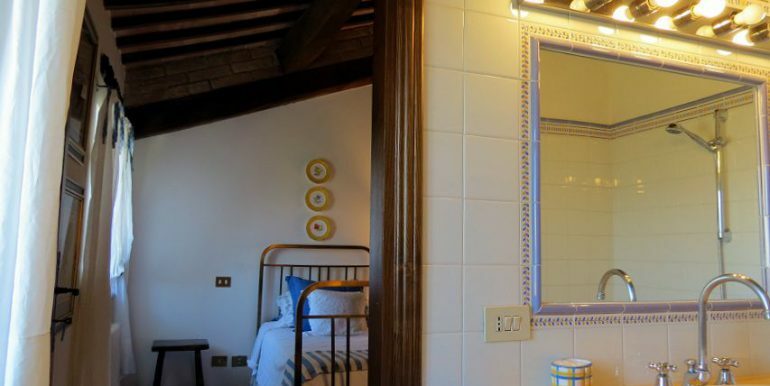 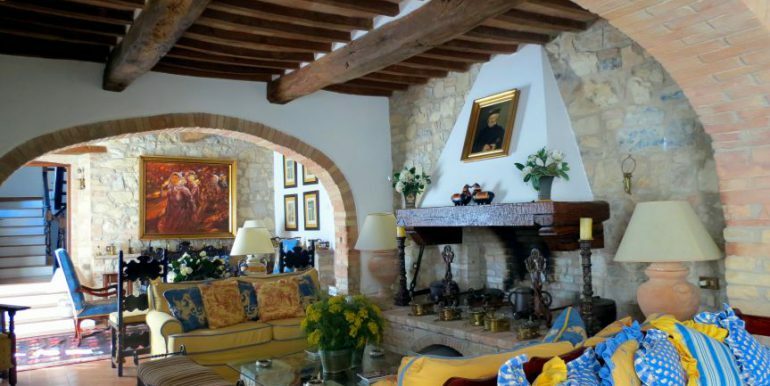 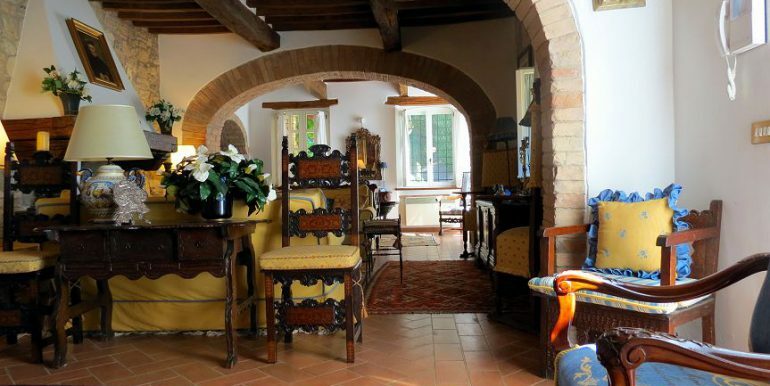 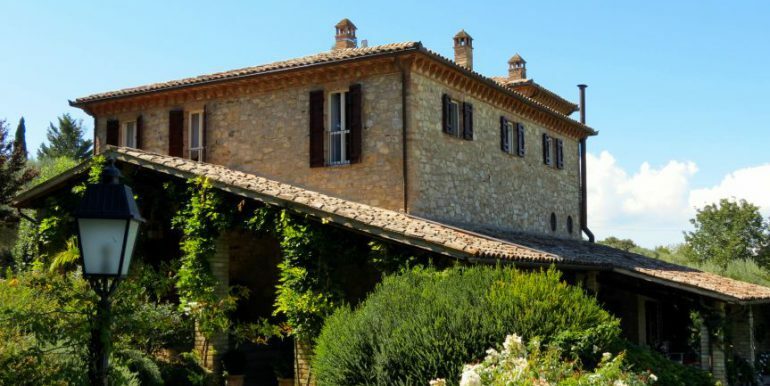 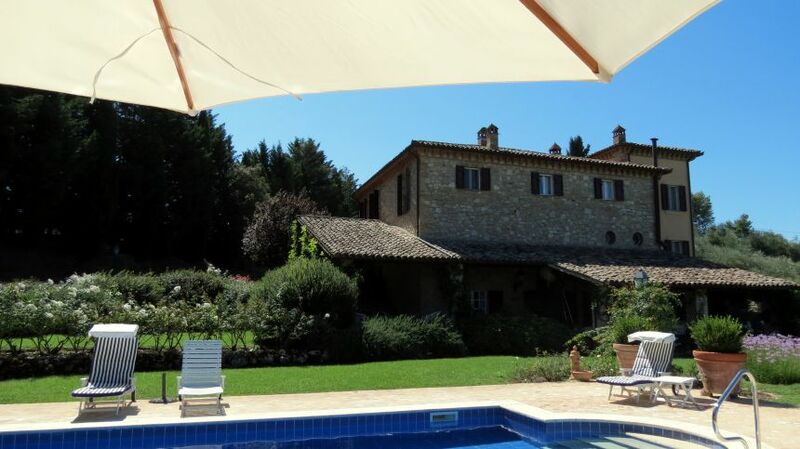 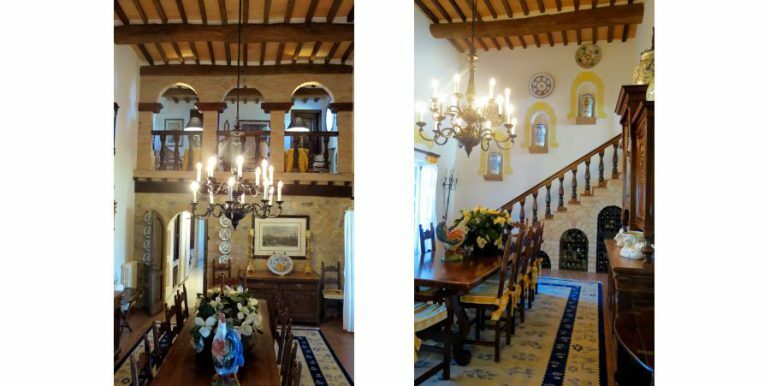 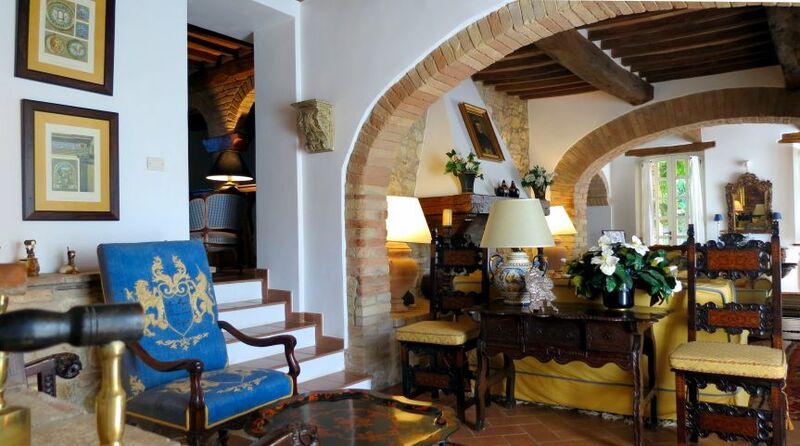 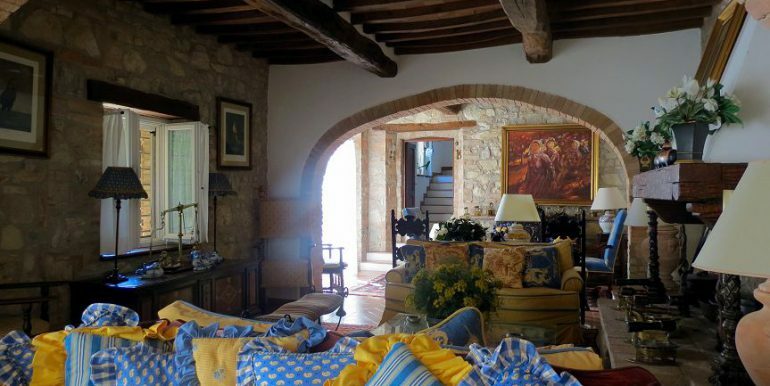 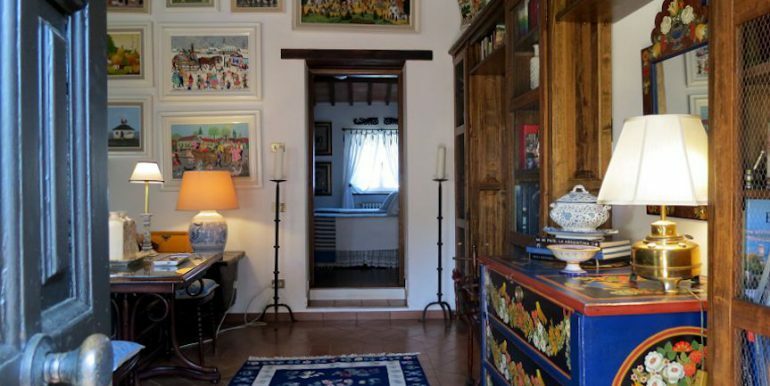 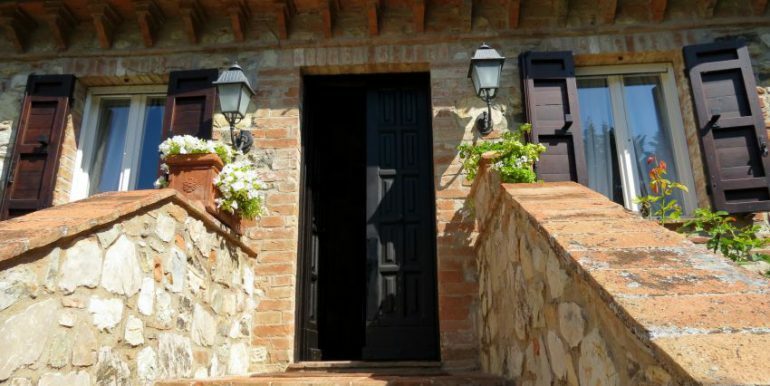 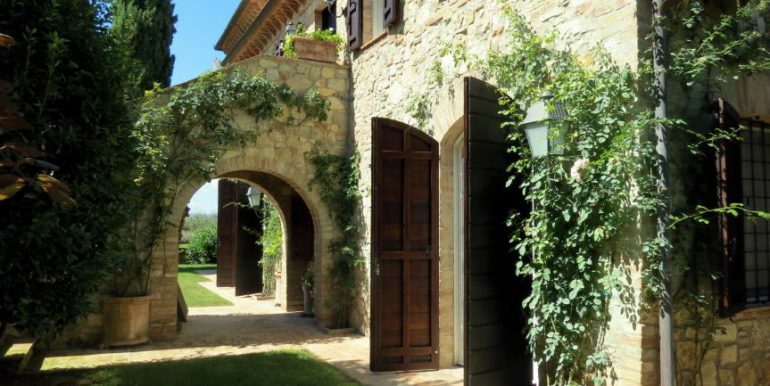 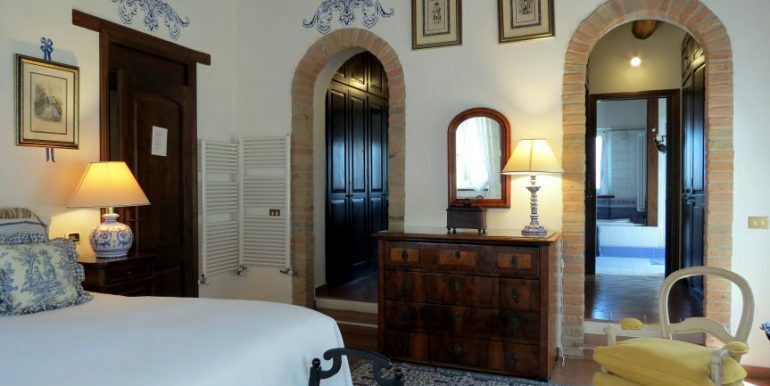 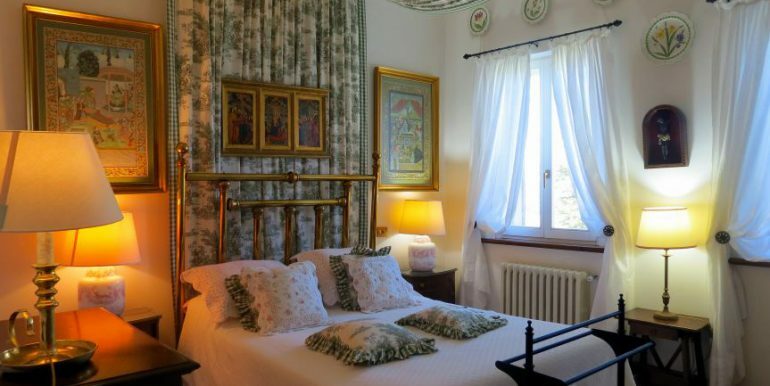 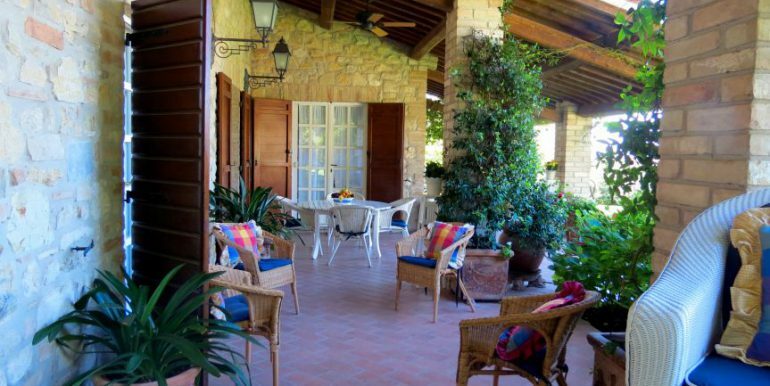 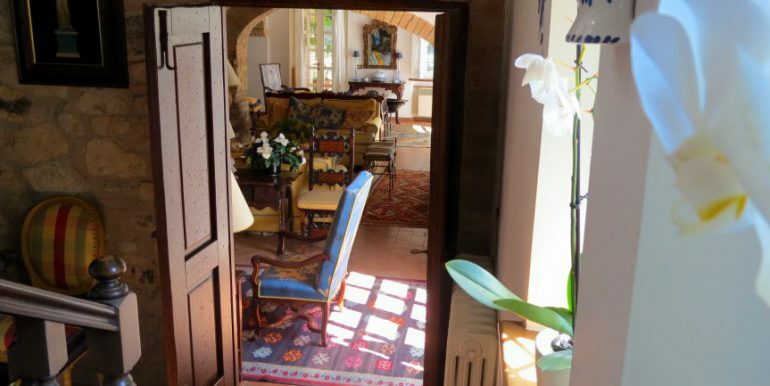 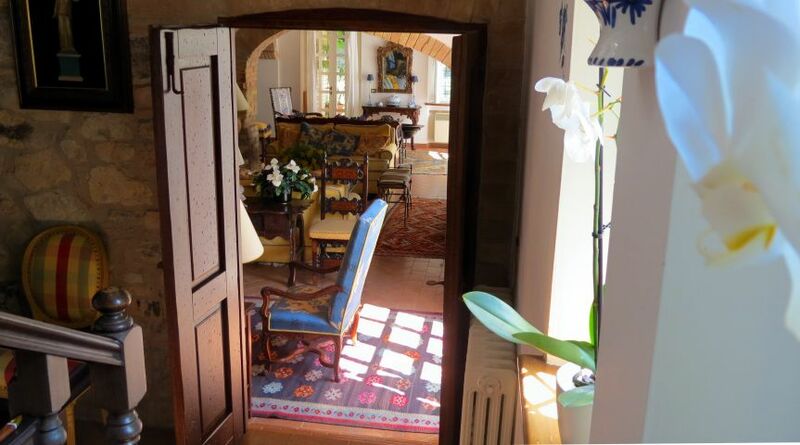 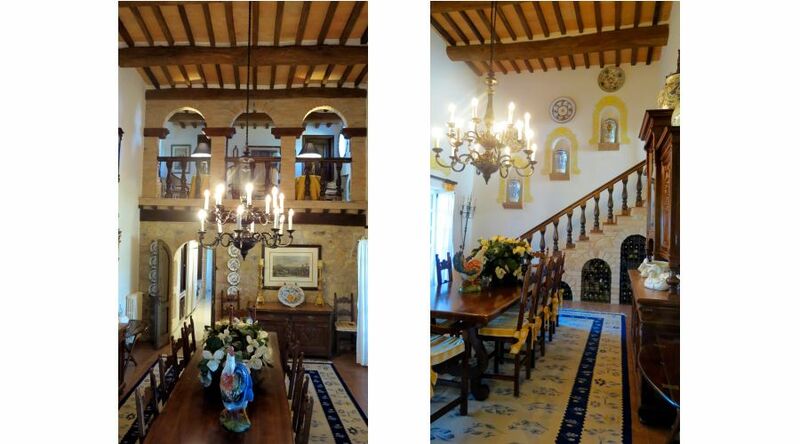 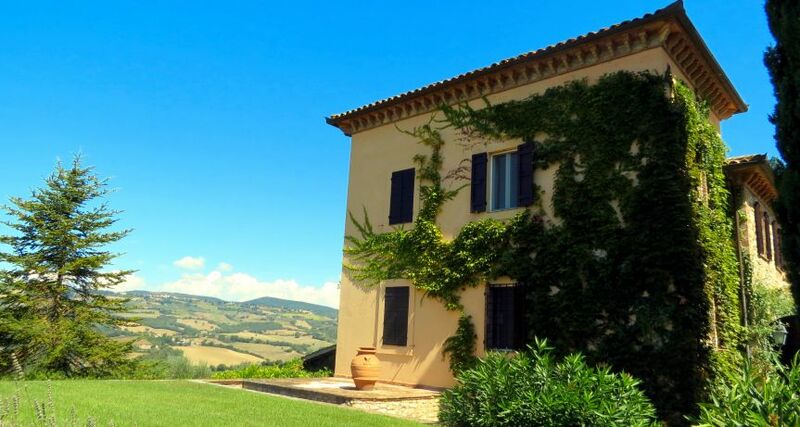 This prestigious completely furnished nineteenth century mansion has undergone an extensive restoration, blending the traditional rural architecture of Umbria with impressive features like the elegant outside staircase. 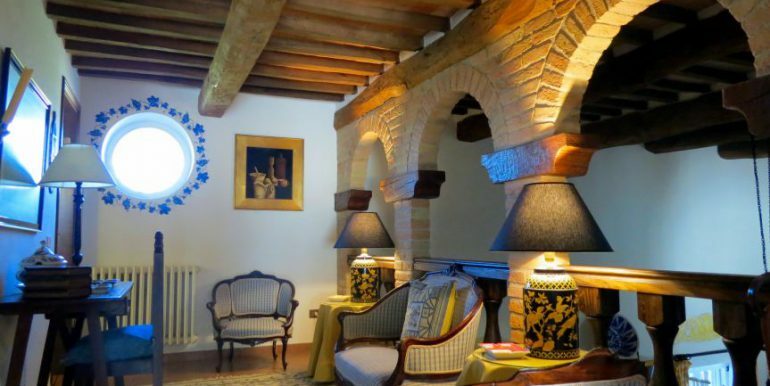 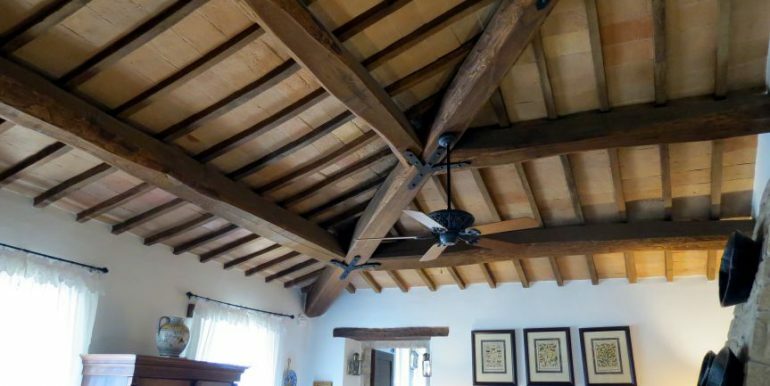 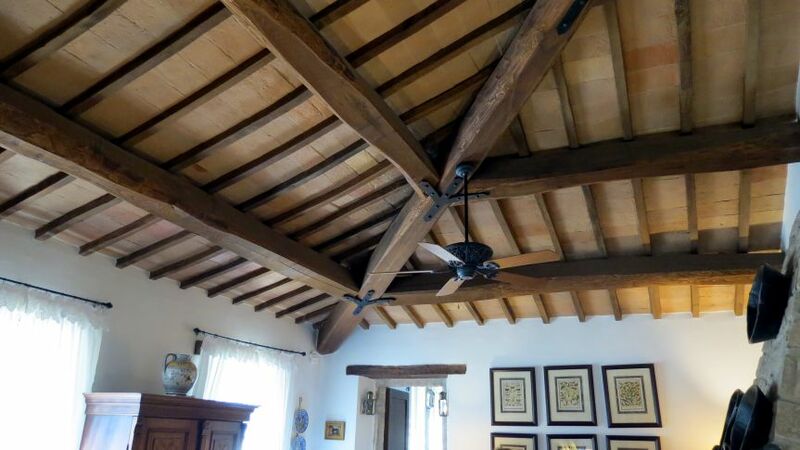 During the renovation many original architectural details have been carefully preserved like bricks and tiles along with traditional beamed ceilings and terracotta floors. 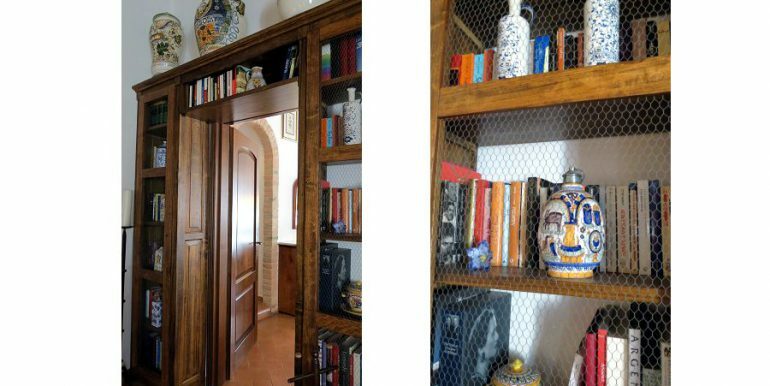 The house spreads out over three floors with a total of 356 square meters with an additional 36 sq m garage and 110 sq m of porches. 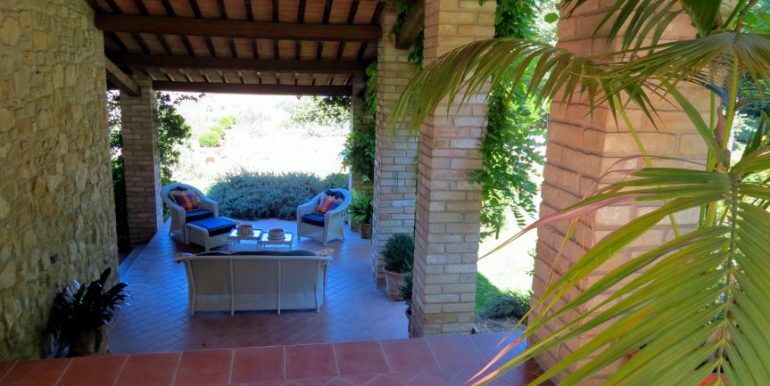 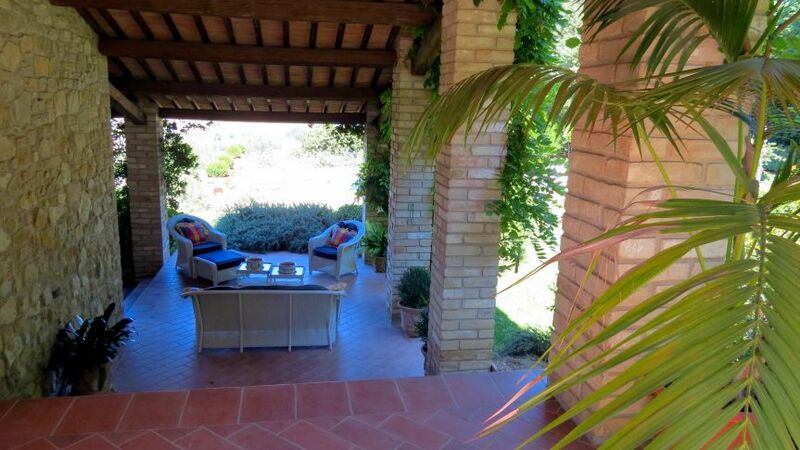 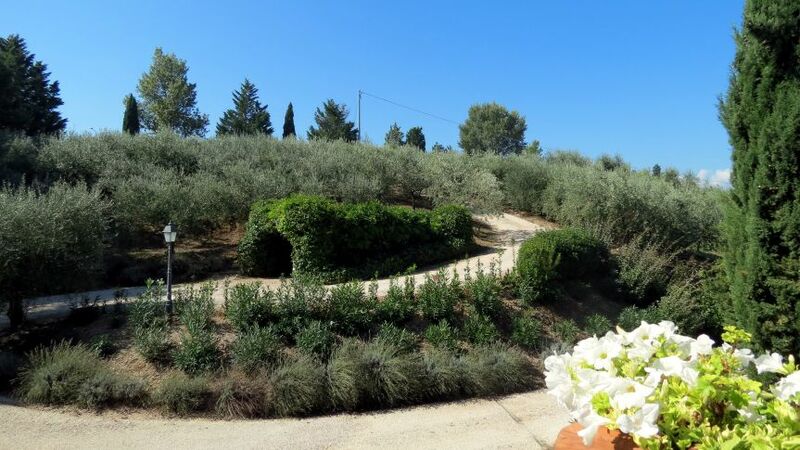 A lush and creative garden surrounds the house with the olive groove as a buffer between the house and the etrance gate. 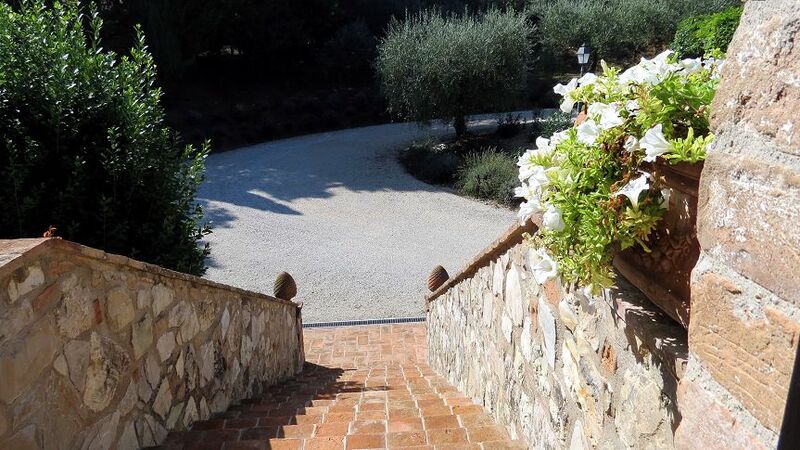 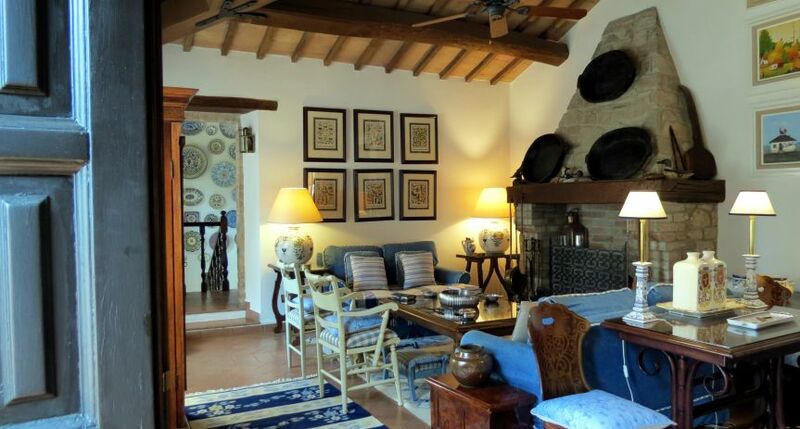 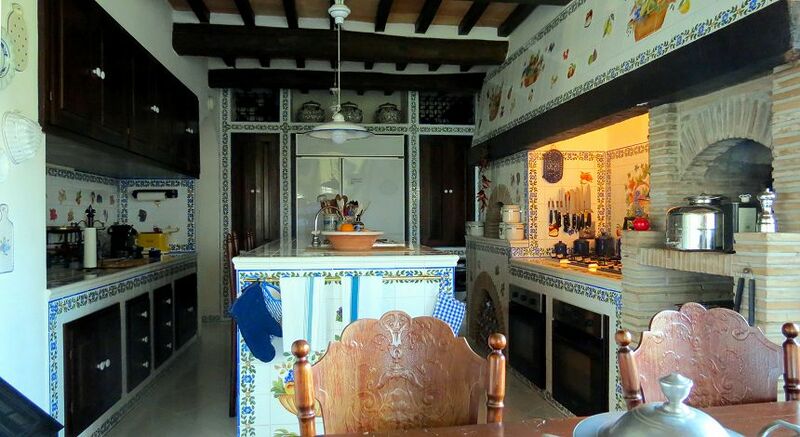 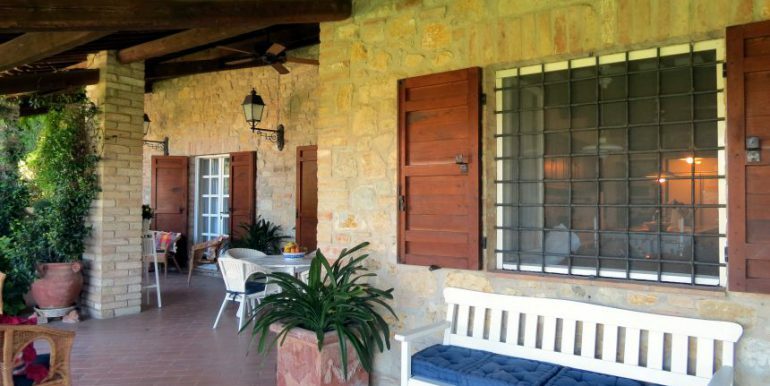 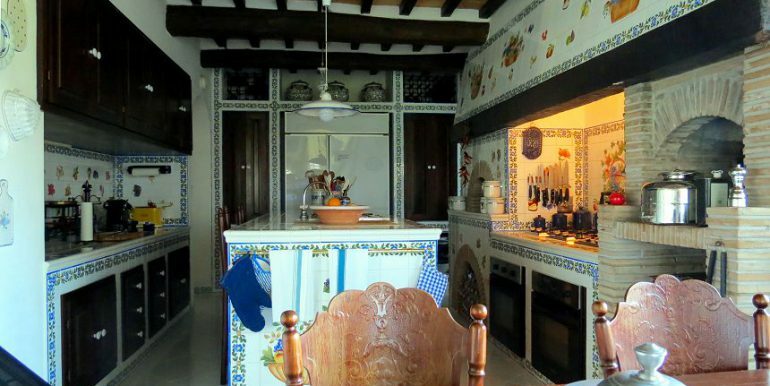 The property enjoys a private and quiet location private yet it takes only a 5 minute walk to reach the nearest village which offers a bar, small supermarket and a restaurant. 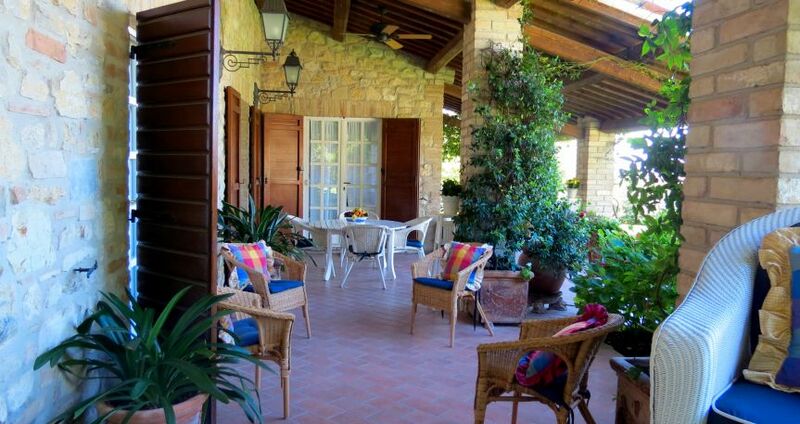 Ground floor: The large kitchen features a breakfast corner and offers direct access to the 110 sq m covered porch and pool area outside as well as a pantry, bathroom and storage space inside. 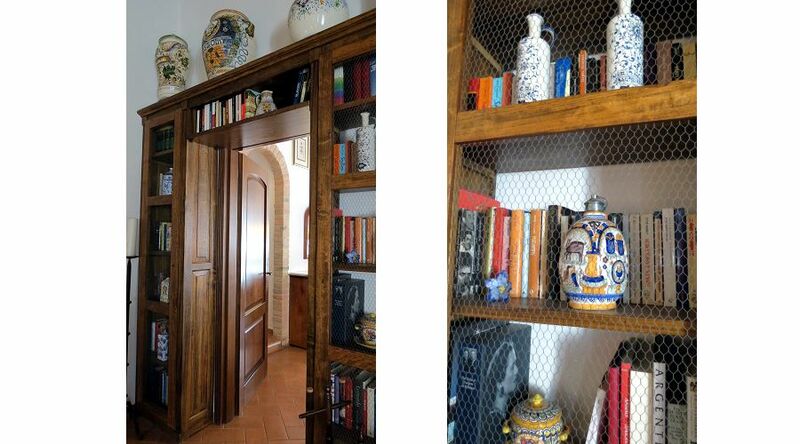 From the pantry there is access to the garage. 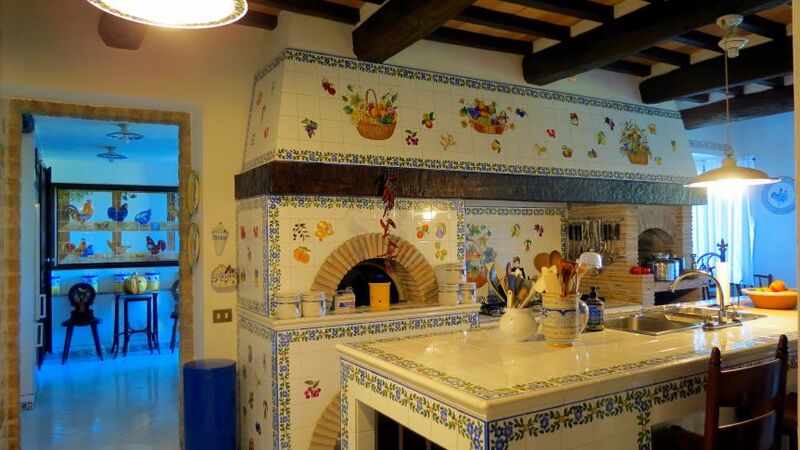 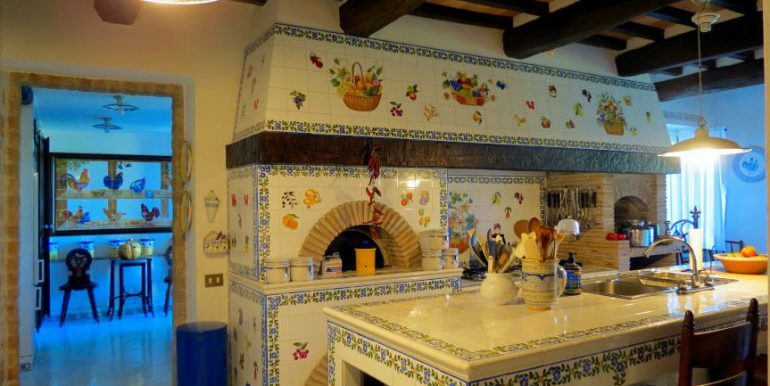 The kitchen features a fireplace, center island and high grade appliances and has been decorated with ceramic tiles which also cover the characteristic and overly efficient wood oven of Central European design situated in the dining room. 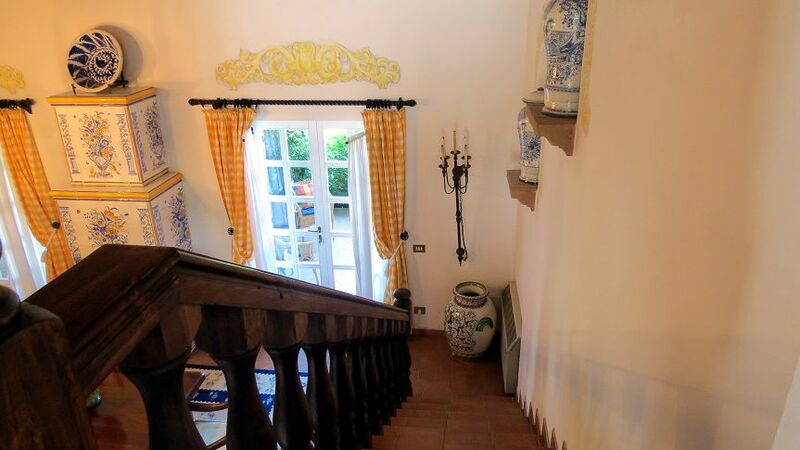 First floor: A monumental staircase leads from the dining room to the first floor living room. 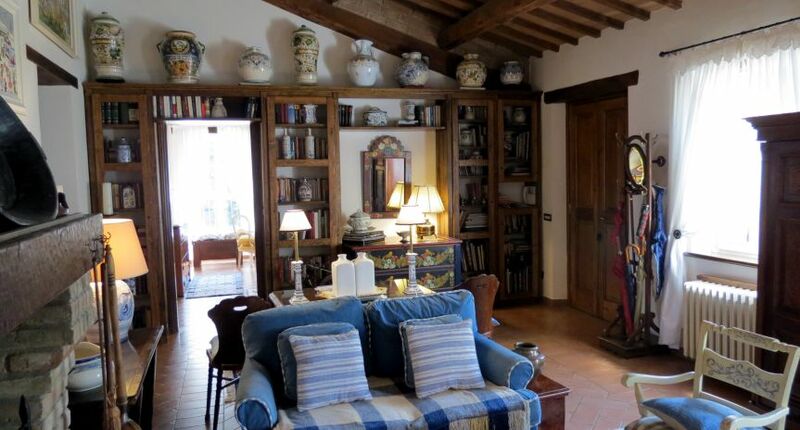 The living is a large but very pleasant space featuring a fireplace, access to a veranda and a separate and intimate sitting area at loft balcony over the dining room, giving access to a powder room. 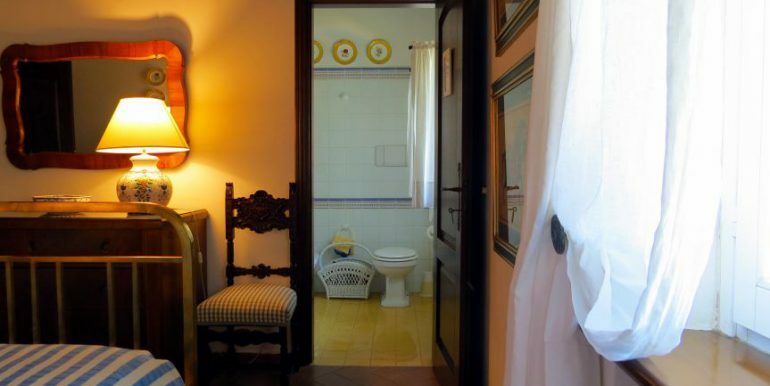 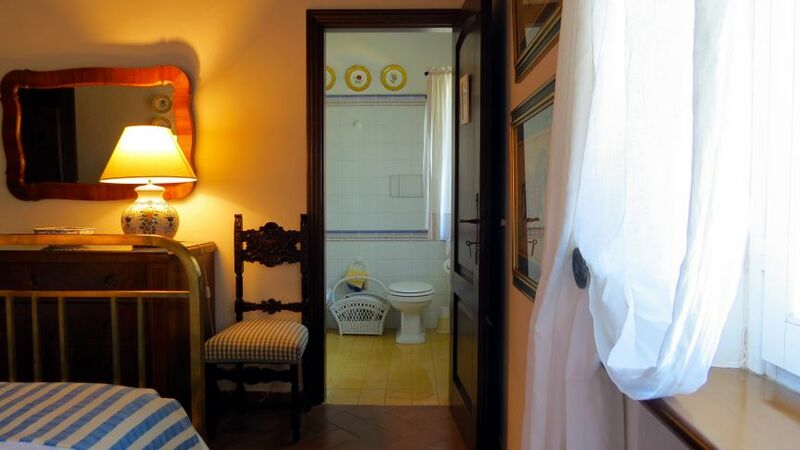 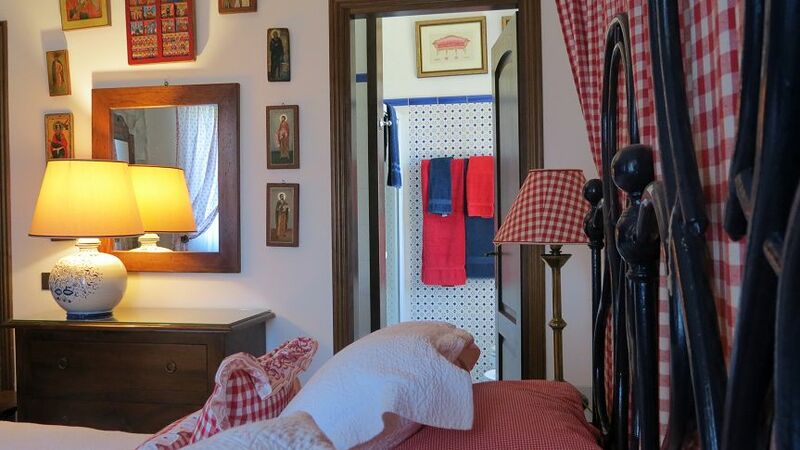 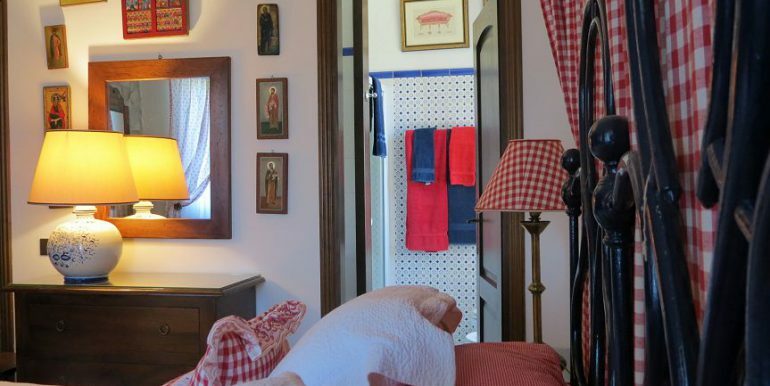 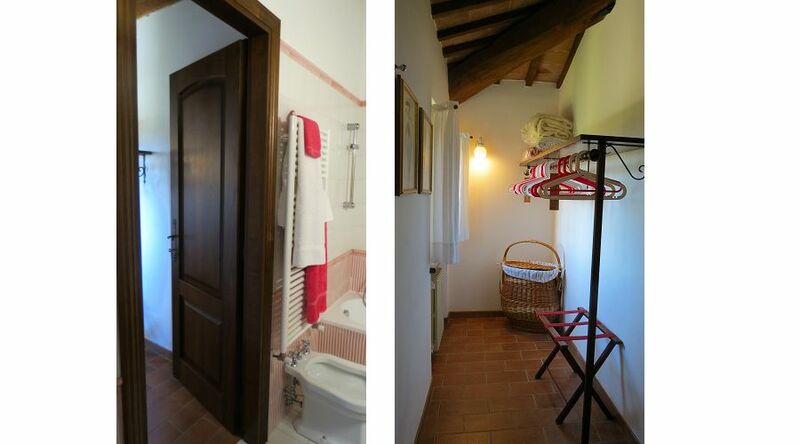 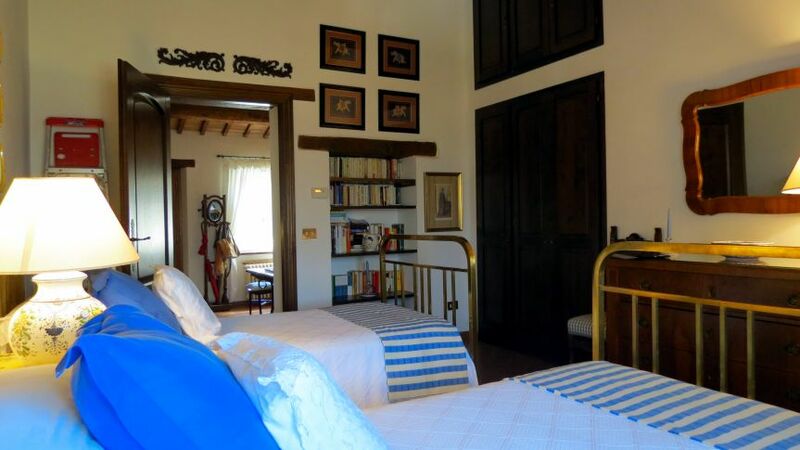 Next to the living is a charming bedroom with en-suite bathroom with shower and closet. 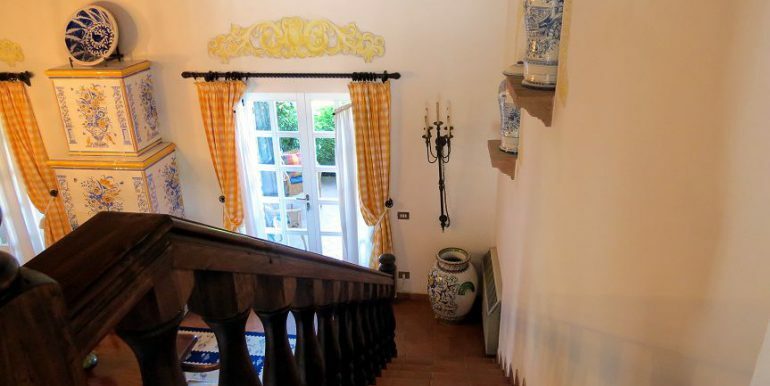 Second floor: This floor can be reached both via the internal as well as the external staircase leads which both lead to a second living room, also with fireplace. This floor harbors a study, two bedrooms with en-suite bathrooms with bath and a splendid master bedroom. 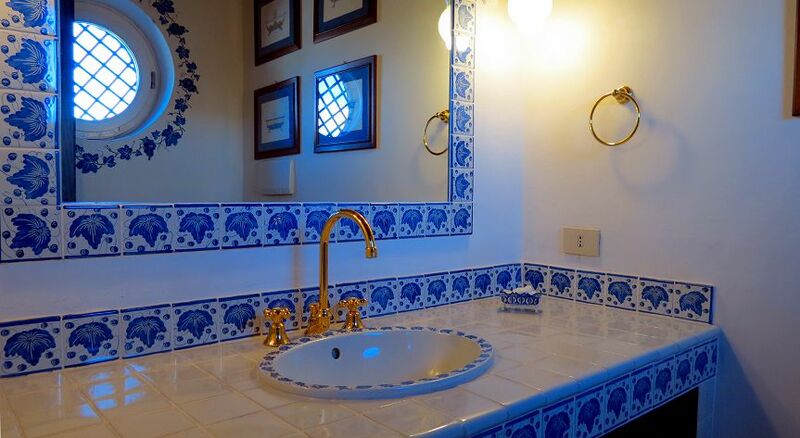 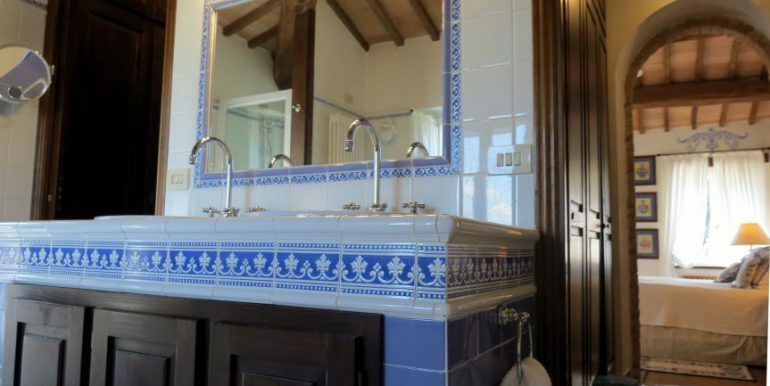 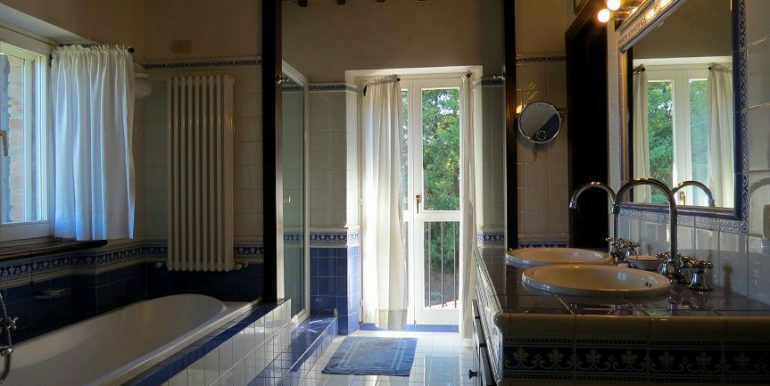 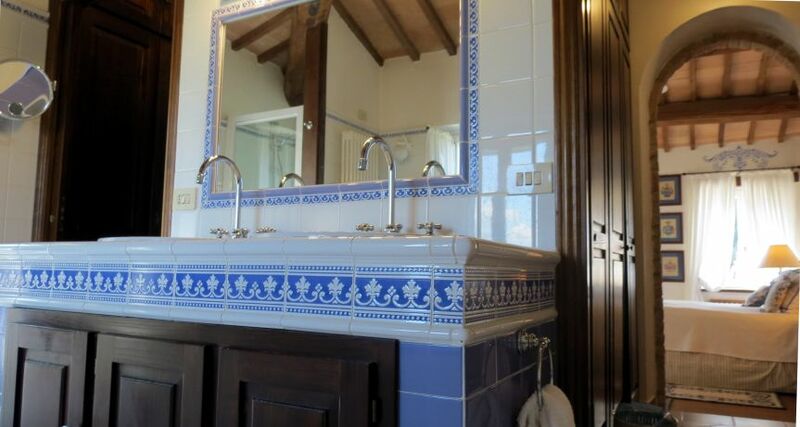 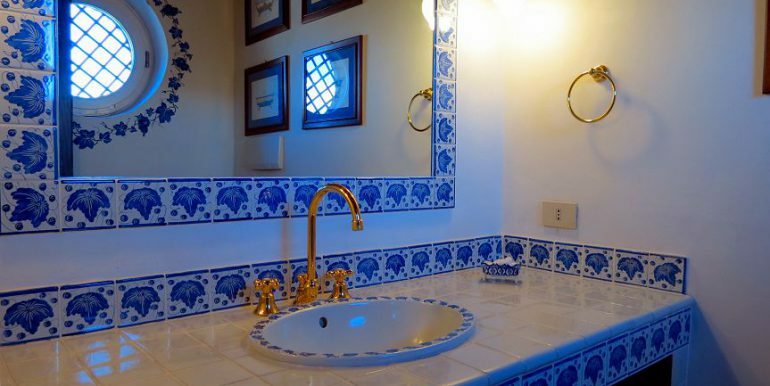 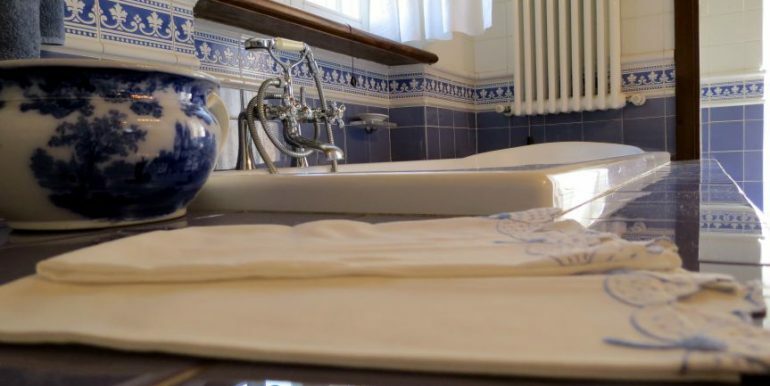 The master bathroom features double vanities, a shower as well as a bath and a french balcony. 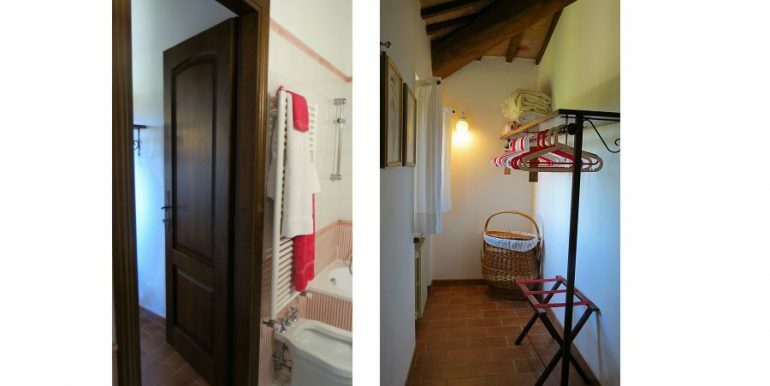 Between the bathroom and the bedroom two hallways feature a “him and her” walk-through closet. 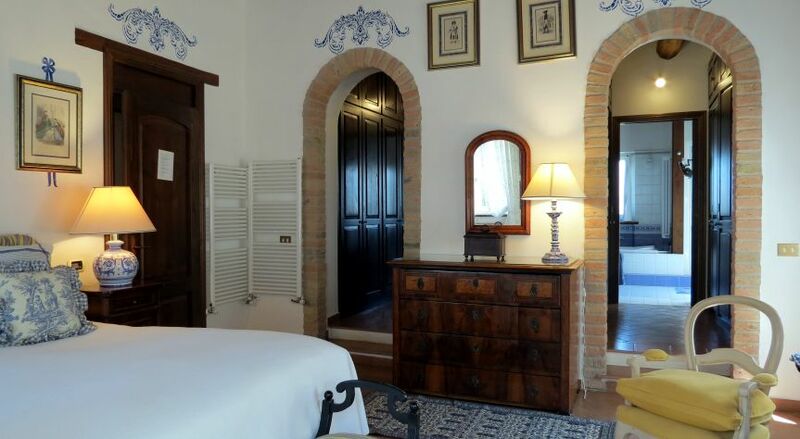 All bedrooms offer ceiling fans and mosquito nets, all doors and frames are made of chestnut wood and closets and shelving are handmade. 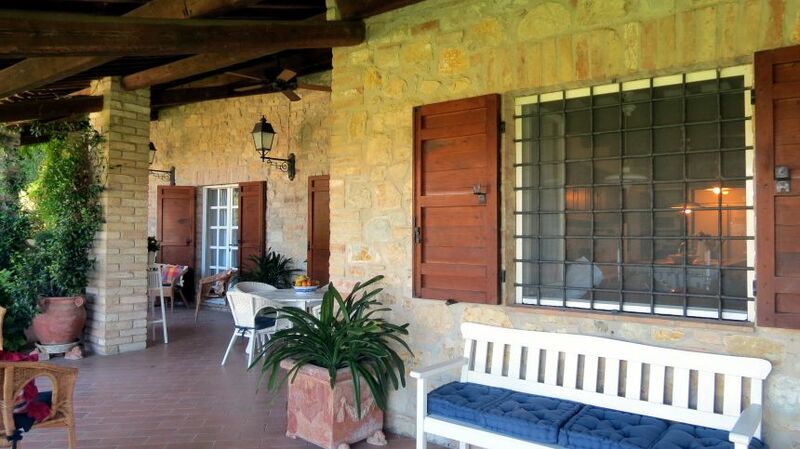 The property is completely fenced and the entrance, just off the tarmac main road, is adorned with a large iron gate. 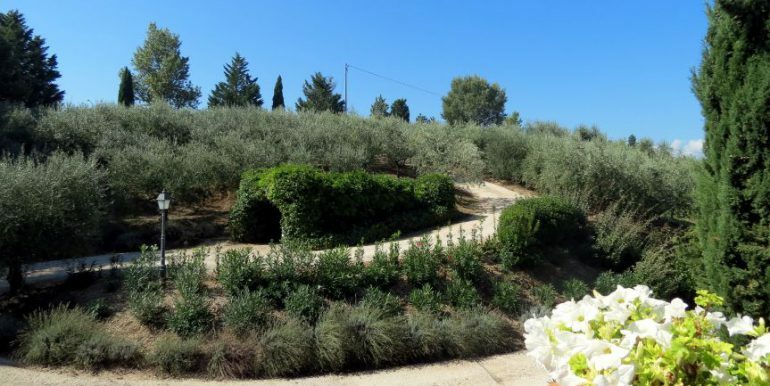 The land covers about 6,000 square meters and includes 200 olive trees, a beautiful and well maintained garden showcasing a variety of roses, hedges of lavender, cypress trees as well as an orchard with various fruit trees. 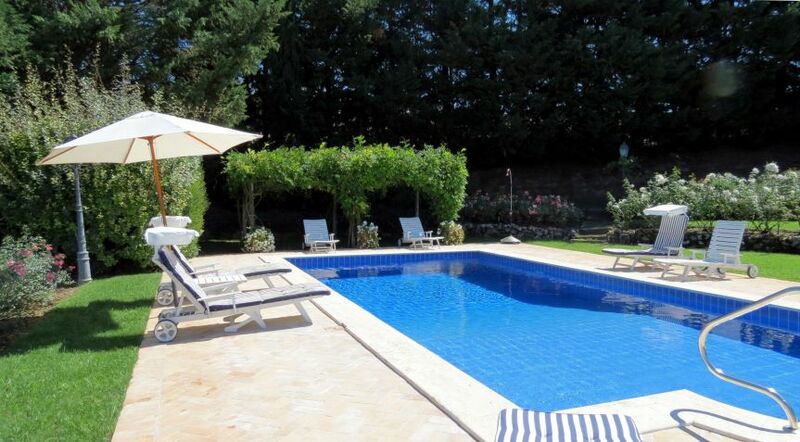 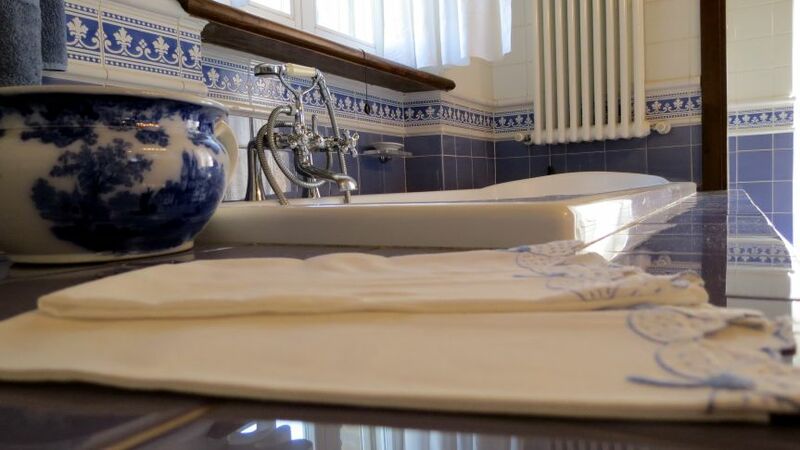 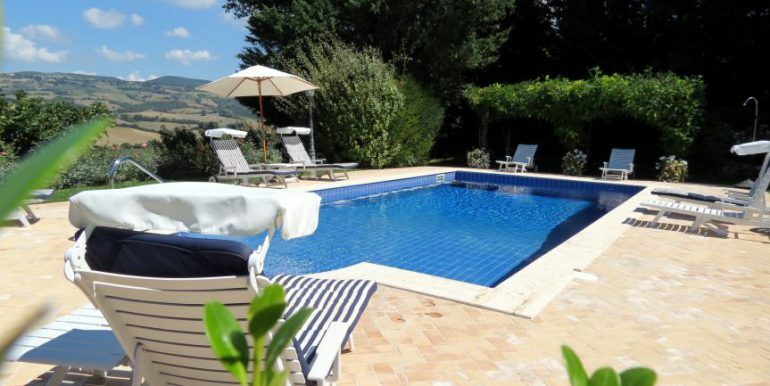 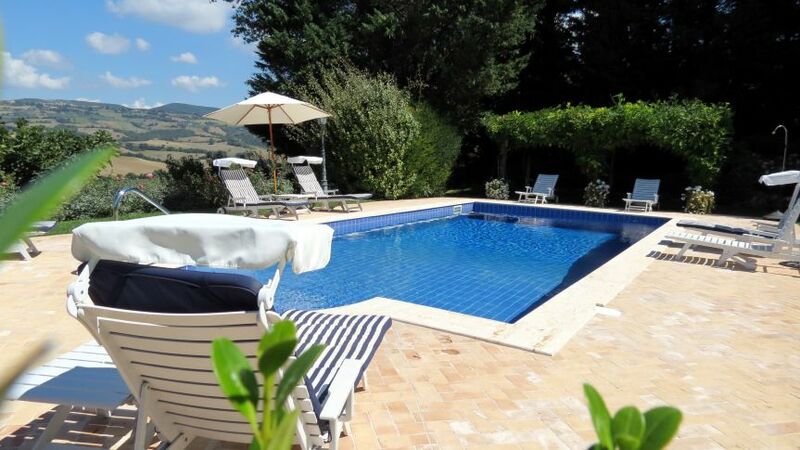 The pool measures 5 x 10 meters and has been stylishly tiled with blue ceramic tiles. 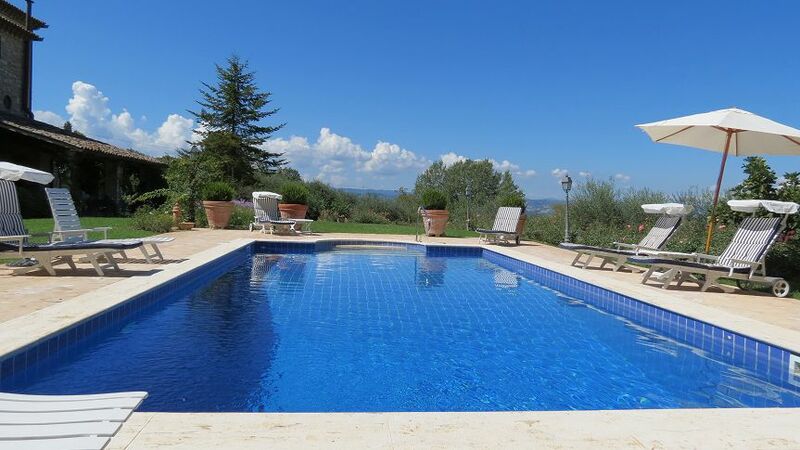 A cotto sun deck wraps around the edge with plenty of space for sunbathing and entertainment while enjoying the delightful view of the countryside. 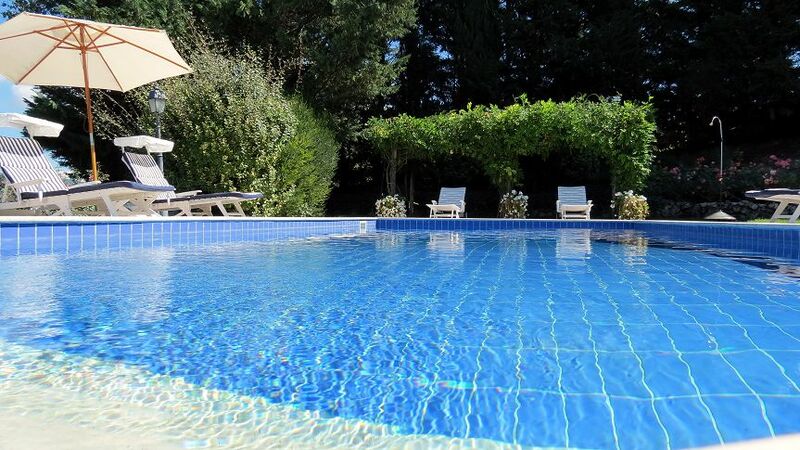 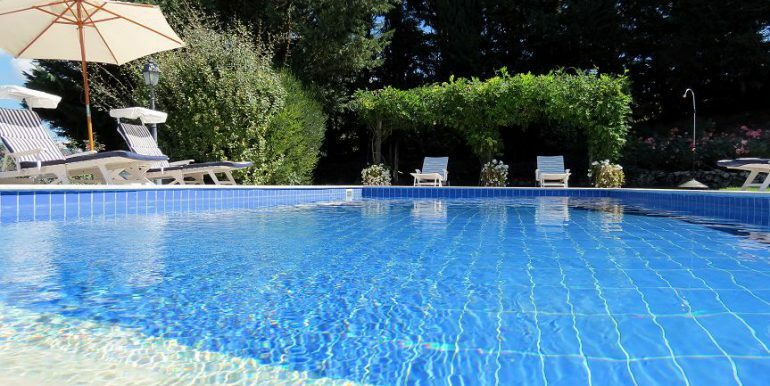 Situated behind the house in a sheltered area the pool lies surrounded by rose gardens and cypress trees and is just the prefect spot to unwind and relax. 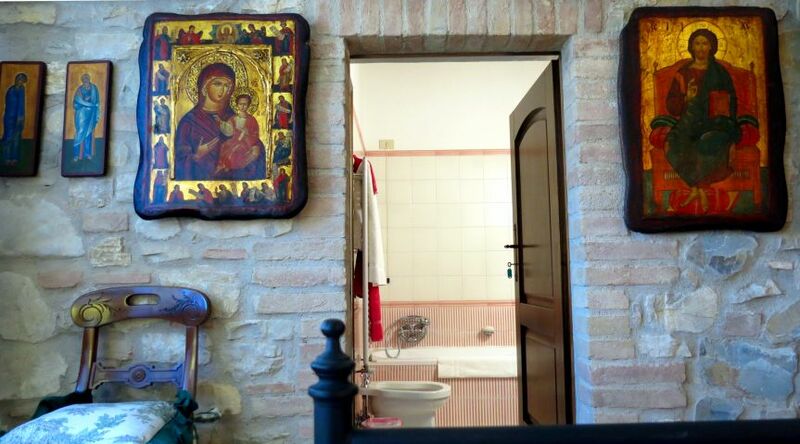 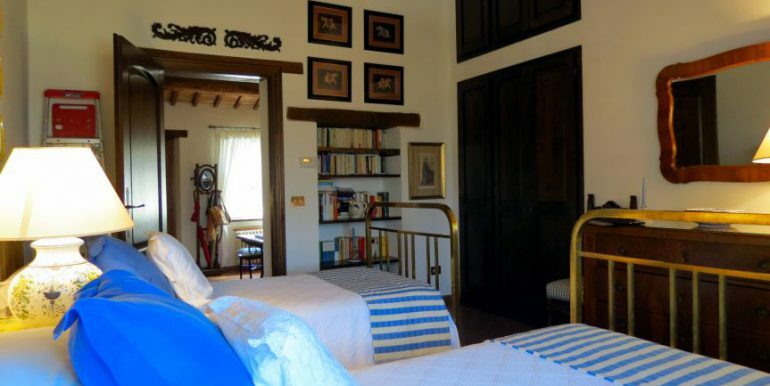 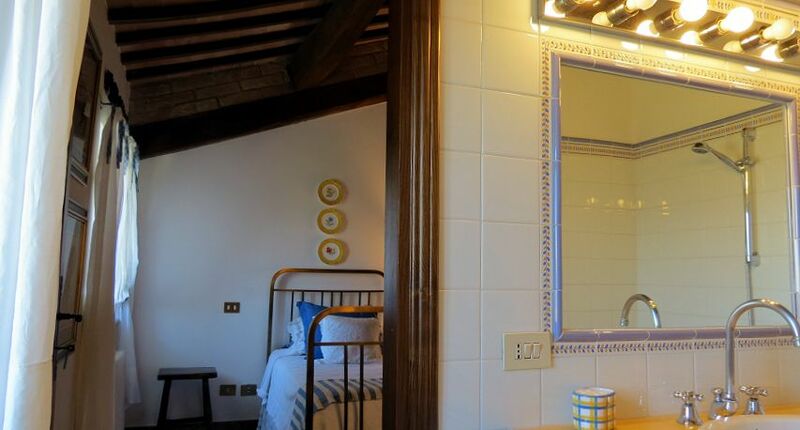 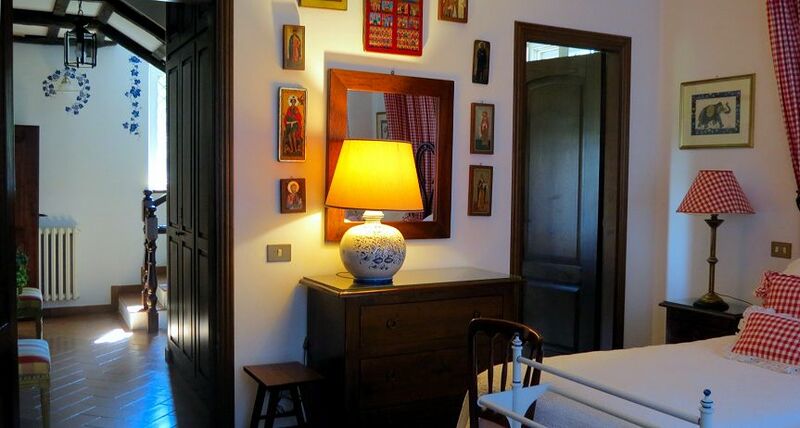 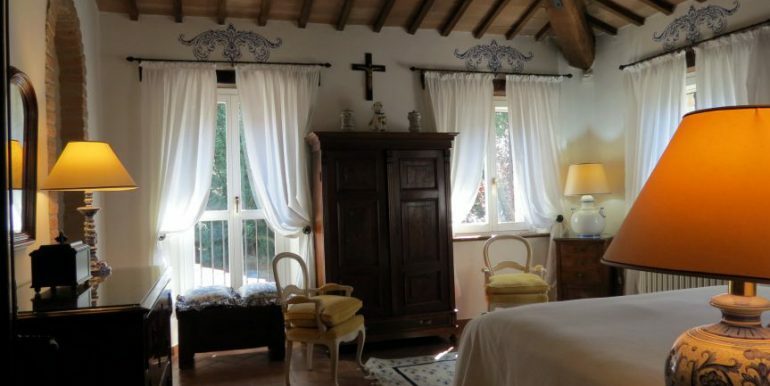 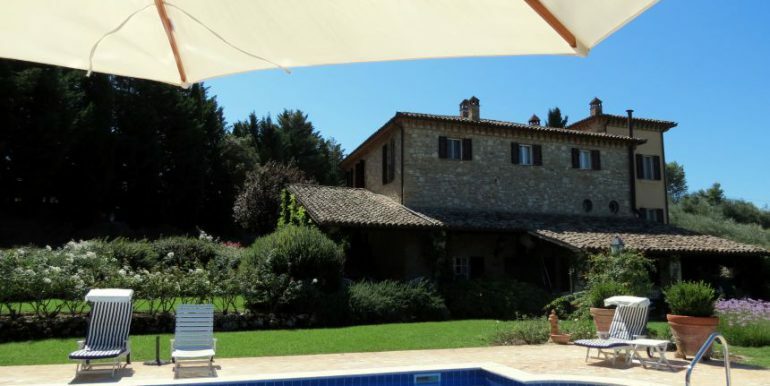 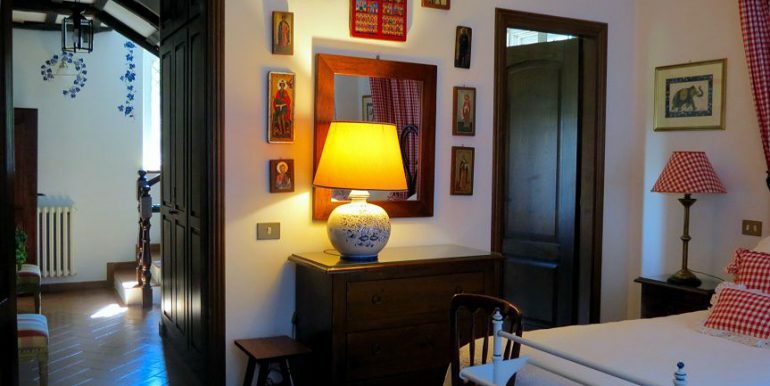 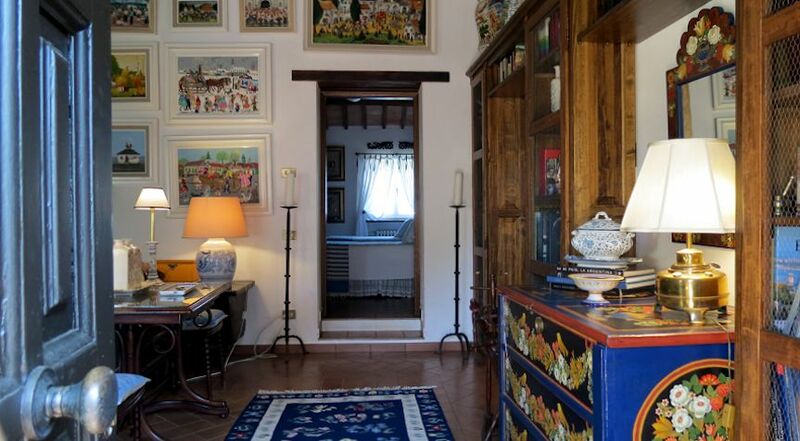 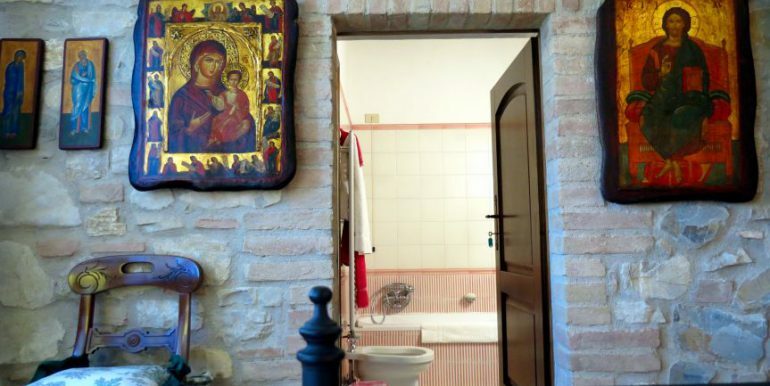 The property is located in Due Santi a neighborhood of the medieval town of Todi, surrounded by the beautiful nature of the Tiber Valley. 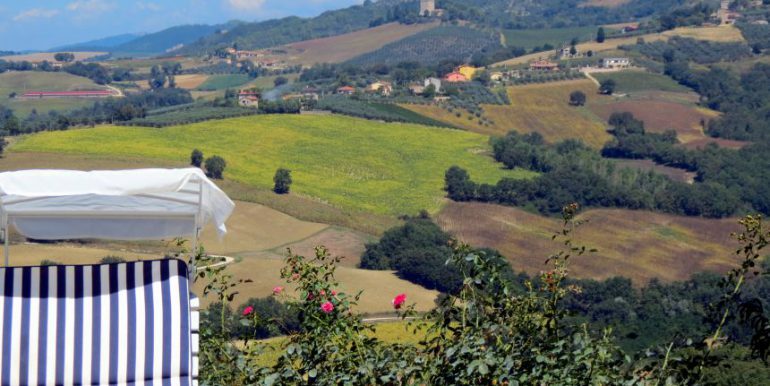 Many interesting towns and sites as vineyards are located at a short distance. 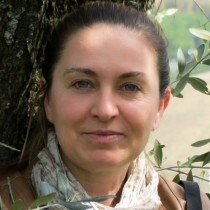 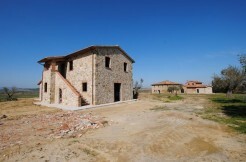 The international airport of Perugia is only 47 km away and can be reached in 40 minutes. 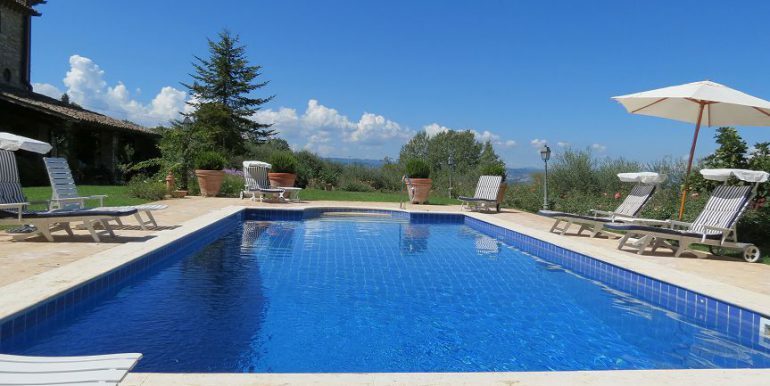 Rome and Florence are respectively 165 km and 200 km away and are easily accessible by the E45 and the A1 motorway.